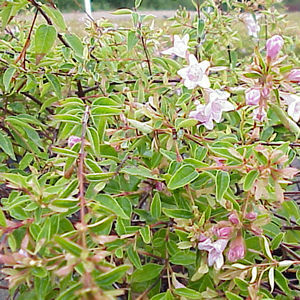 Pink Abelia or Abelia x ‘Edward Goucher’ can be a evergreen or semi-evergreen shrub depending on the zone. The cultivar grows 3-5′ tall and 5 feet wide. ‘Ed Goucher’ has a lacier foliage than A. grandiflora and can be somewhat less hardy. ‘Edward Goucher’ is a result of a cross between A. x grandiflora and A. schumannii. Pink Abelia produces liliac-pink flowers in the spring and a bronzy foliage in the fall.